If you LOVE chocolate then this is the cake for you! 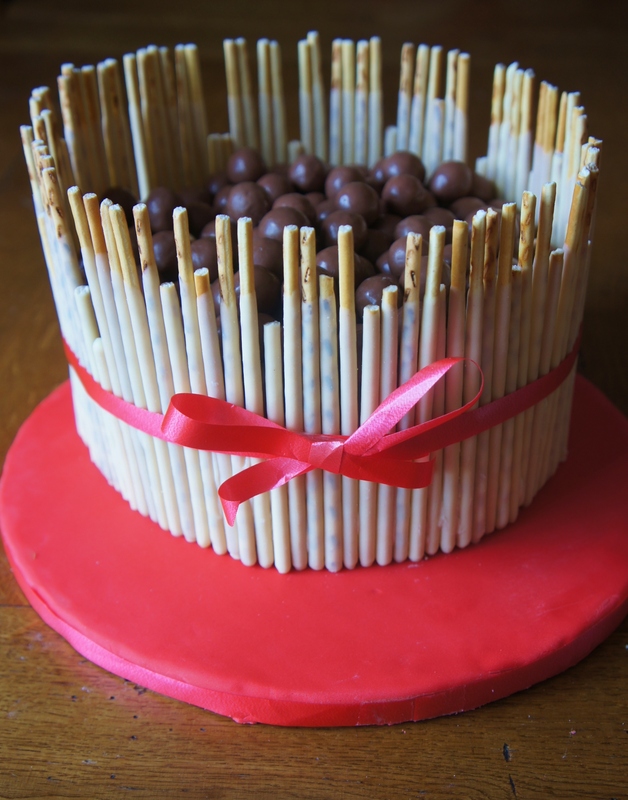 Two layers of moist chocolate sponge sandwiched together and covered in delcious white chocolate buttercream, wrapped in biscuit twigs dipped in smooth white chocolate (otherwise known as Mikado’s), filled with crunchy Maltesers and finally tied together with a bow. I have tried many chocolate cakes in the past and I have sometimes thought woahhhh this is far too sickly, what I wanted to achieve from this cake was a balance between flavours and textures. 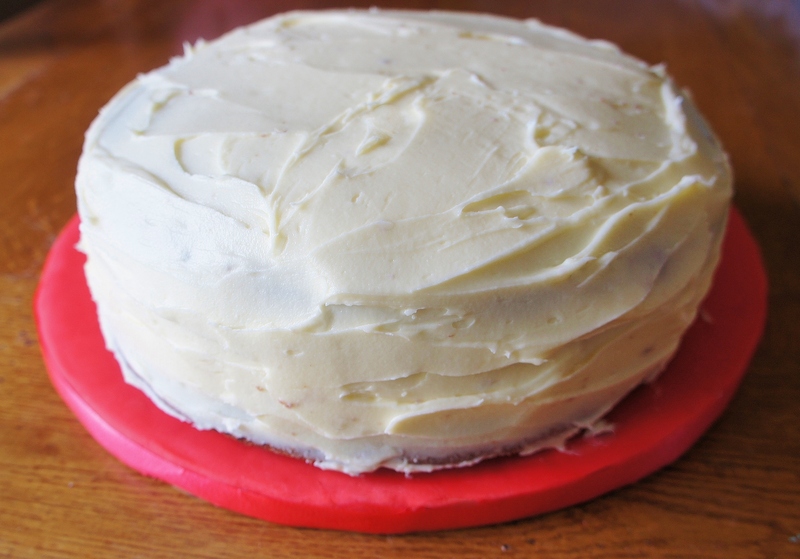 The white chocolate buttercream works very well to balance the rich chocolate sponge, as does the soft, moist texture of the cake and frosting compared to the added crunch from the Mikados and Maltesers. Below I have given instructions on how to recreate this cake for yourself, however I also can make this cake for you so please ‘like’ my Facebook page ‘Jessie-Cakes’ where you can find further information about prices and deliveries. P.S – This was my first attempt of writing with icing, it was a lot harder than I thought! So please excuse the wobbly lettering, I have since improved! 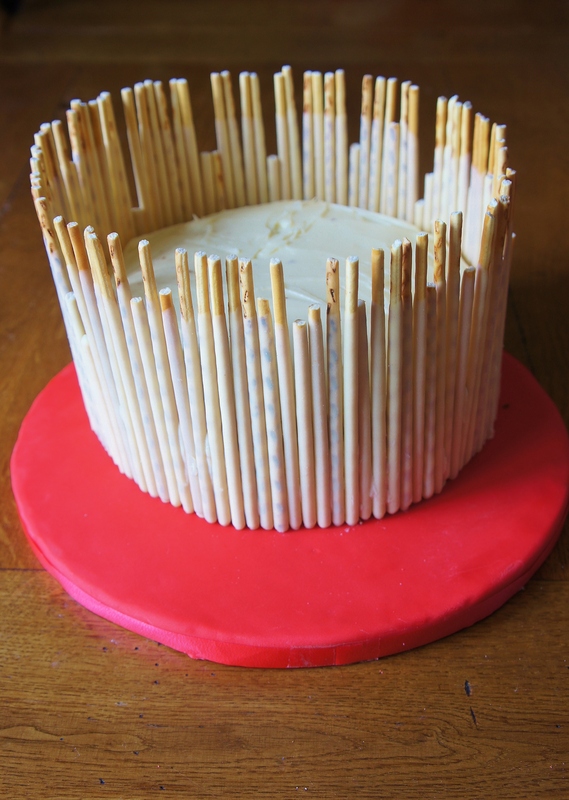 Okay so first of all begin by wrapping your cake in Mikado’s, making sure each twig is as close as possible to the other. Press each one lightly into the buttercream as this will help them stick. This is quite time-consuming but be patient it will be worth it! If some of the Mikado’s have snapped do not worry, personally I think having different sizes gives a good rugged effect. 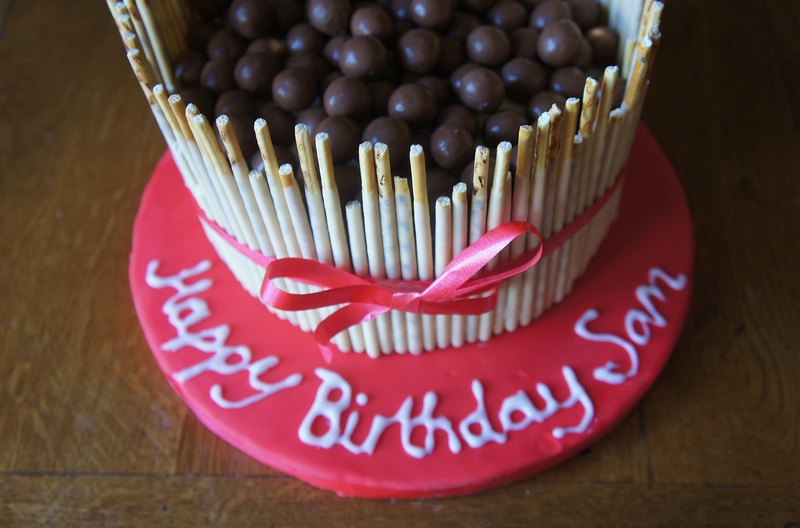 Next, pour the whole bag of Maltesers in the middle of the cake filling it entirely. Wrap your cake in ribbon and Sellotope together. Make a bow out of the ribbon and attach this using Sellotape or a double-sided sticky pad. Finally, combine 4 tsp icing sugar with a little water to form a thick paste. Use a toothpick to mark out your lettering and then use a piping bag and very small round nozzle to pipe your lettering.